Fujifilm FinePix XP130 Review - The Fujifilm FinePix XP130 Updates the XP120, and adds Bluetooth, plus improved Battery life. There's a 5x optical zoom lens, and the camera is waterproof down to 20 meters. It comes with 16 Megapixel Camera, 3inch Screen and Full HD video recording. As with the previous XP120 camera, it is waterproof down to 20 metres, shockproof from a height of 1.75 metres, freeze-proof down to minus 10 degrees Celsius and dustproof. XP130 doesn't have a viewfinder and no option for external viewfinder. Fujifilm XP130 can shoot continuously at max speed of 10.0 fps and has max shutter speed of 1/2000 sec. Unfortunately, XP130 doesn't have an external flash shoe so you are limited with the built-in flash. Fujifilm XP130 doesn't have any connections for external microphones and headphones. Fujifilm XP130 Comes with a built-in microphone and a Mono speaker. 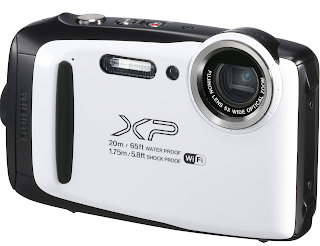 The Fujifilm FinePix XP130 comes with 5 colors - Blue, Lime, Silver, White and Yellow.